McMonagle Stone are giving one lucky Facebook follower the chance to WIN two gold granite natural stone planters. Natural stone planters are an excellent addition to any garden or patio area. With Spring around the corner they will add warmth and enhance the appearance of your garden with beautiful flowers. 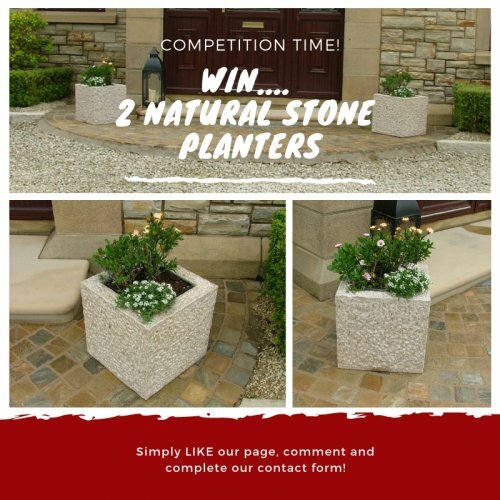 If you are a garden enthusiast that takes pride in gardening then our natural stone planters will be the ideal treat for you. Natural Stone planters are a durable alternative to ceramic and plastic flower pots as they will withstand cold and windy weather conditions. To enter the competition draw please follow the following 4 easy steps. Login to Facebook and visit McMonagle Stone's Facebook page here. Comment under any competition post. Complete our contact form on our NEW website to let us know you have entered. To avoid an invalid entry please make sure you have completed the above steps correctly. The winner will be chosen at random once we've reached 10,000 Facebook LIKES and will be announced via Facebook. By completing our contact form we will be able to contact the Winner directly via phone or email to arrange delivery. All other entry forms will then be deleted once the competition is over. McMonagle Stone offers a broad range of natural stone landscaping and garden acessories. Browse our online shop here for further product information and imagery. Should you wish to check stock availability or request a quote please do not hestiate to contact your nearest sales depot here. THIS COMPETITION IS NOW CLOSED! CONGRATULATIONS TO OUR WINNER SANDRA MAHON.